A compound butter is a simple culinary term that refers to any butter to which other flavorings are added. This technique is wonderful for chicken as well. 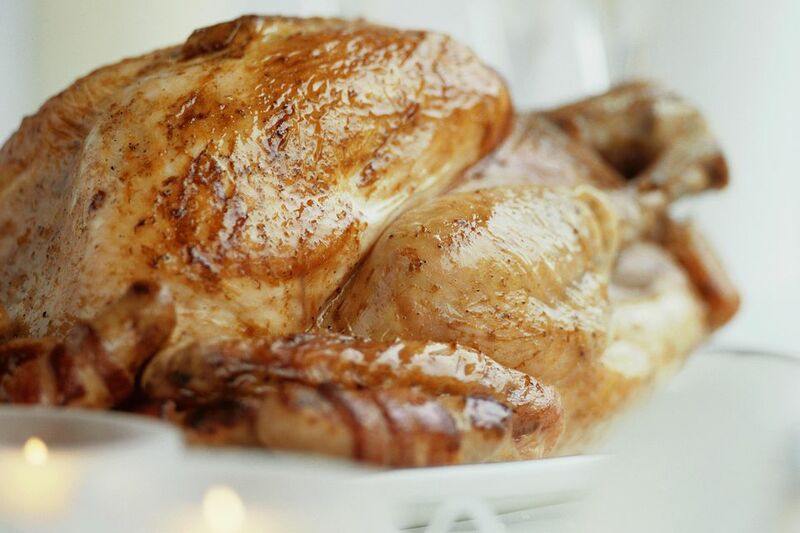 It really keeps the breast moist, adds flavor, and gives the skin a great crisp, shiny finish. The "secret" ingredient is a small dash of Chinese five spice, which contains ginger, cinnamon, and star anise and gives the turkey a very subtle and delicious aroma. This recipe makes enough for a 20-pound Turkey. In a small bowl, combine of all ingredients and mash with a fork until completely mixed. Position the turkey so that the cavity is facing you and you are working forward towards the neck. Using a long, thin flexible rubber or silicone spatula, slowly slide the tool between the skin and the flesh of the breasts on both sides of the breastbone. Divide the butter mixture in half and stuff it under the skin on both sides and massage it down toward the front of the bird. Spread as evenly as possible, but don't worry about getting it perfect, as it will melt and spread out as the turkey roasts. Roast the bird according to whatever recipe you're following and cover the breasts with a piece of foil if it's getting too brown towards the end of the cooking time.